Building technologies are in a state of continuous flux, but in recent years the breadth of this topic has outdistanced architecture and traditional engineered systems. 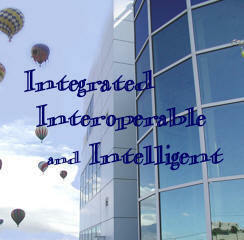 Today, building technology includes wide ranging information technology (IT) and Internet services. Online technologies for next generation buildings hold significant promise, but implementation in actual facilities often lags availability. Readers of ES have seen editorial supplements with great information on Convergence, but many ask …who is really doing this? Builconn, the pre-eminent forum for Integrated and Interoperable buildings, developed a new awards program to answer that question and highlight just those types of buildings. The Buildy Awards were designed to increase awareness of the benefits to whole building integration, and to honor North American facilities that demonstrate the vision of networked building systems and strategies. This means effectively integrating a wide array of building systems and enabling operations over corporate IT infrastructures. The Best Integration Project Buildy Award winner is an example of such a building. The Summit Building is shown below during the Albuquerque Hot Air Balloon Fiesta, which takes place this month. The term of art used for this technology in the past was Intelligent Building. Intelligent Buildings have been discussed for more than three decades, but only recently have they become viable. Actually the old definition of Intelligent Buildings falls far short of the “Buildy” level. 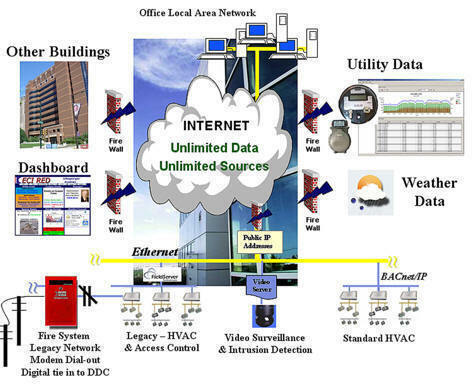 1980’s Intelligent Building technology envisioned integrated Automation for energy management, fire alarm and security. A key goal was to combine system and telecommunication cabling. The Internet and IT were barely blips on the industry radar screen then. Redefining building systems as a result of IT and the Internet was further extended by the proliferation of data communications standards such as BACnet®. This confluence of events was significant in many ways, but most important it made it possible for building systems to integrate devices and software developed for much larger markets. Evolution of proprietary data communication networks to BACnet® and Ethernet for intranets and then to BACnet/IP and TCP/IP for Inter-networking were significant events. With all these developments the term Integration has taken on new meaning. A simple example of such technology is a Web Browser for interface to building systems, but that is just the start. High Speed Wireless for streaming data and video. Achieving this expanded level of functionality required a new specialized industry professional, the System Integrator. System Integrators combine the power of many computer-based systems in buildings with Information Technology (IT), the Internet and Web Services to increase occupant comfort and productivity. System Integrators apply sophisticated digital hardware, while creating and programming software to make “Convergence” possible. Convergence has been the subject of several editorial supplements in Engineered Systems (ES). It has also been covered in trade publications, industry events, Internet discussion groups, and has even seeped into manufacturers’ web sites. Without a doubt IT convergence is changing the face of the building systems industry, and Buildy awards recognize those who champion the resulting whole building integration. The Summit project blends traditional building systems technology, IT and Web Services to optimize building operations. Whether integration projects begin with Access Control, HVAC, Lighting, Security or IT, the Buildy Awards recognize those companies that have integrated a system into the entire scheme of a building. This building must support the vision of networked systems in which all the facility’s disparate systems are seamlessly integrated to provide managers greater value from their investment.